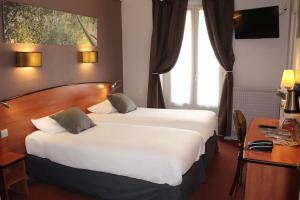 Kyriad Hotel XIII Italie Gobelins is located in the 13th arrondissement of Paris. 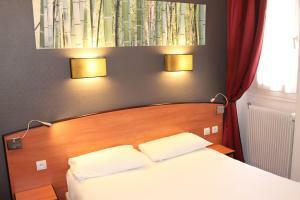 It offers en suite rooms with Wi-Fi access just 100 metres from Gobelins Metro Station. 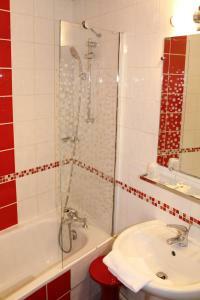 The rooms at the Kyriad have a flat-screen TV with satellite channels, a safe and tea and coffee making facilities. 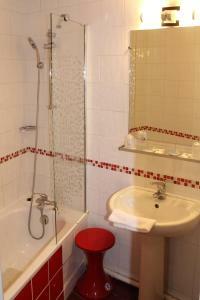 Each has a private bathroom with a bath or shower and some rooms have a balcony. Fresh croissants are served on the hotel’s breakfast buffet every morning. A drinks machine is also available in the 24-hour reception area. Other facilities include a newspaper ordering service. 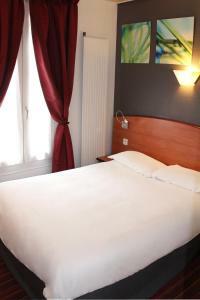 Kyriad Hotel XIII Italie Gobelins is a 10-minute walk from Jardin des Plantes. The local metro station provides direct access to Paris’ sights including Le Louvre, Opéra and the city’s centre, Châtelet. AccorHotels Arena is located 2 km from the property. Guests arriving after 23:00 are kindly requested to inform the hotel in advance. Contact details can be found in the booking confirmation. This room features a satellite TV, safety deposit box, available with an extra cost, and an electric kettle. It is complete with en suite bathroom. Rate: € 70.54; select dates below to get current rates. Rate: € 60.00 ... € 130.00; select dates below to get current rates.